Today’s hike was something that has become somewhat of a tradition – hiking on New Years Day. Six out of the last eight years, I’ve done a hike on New Years Day. Last year I had planned to, but the weather was too bad (Road conditions were very poor at home) so it had to be postponed. I asked a bunch of friends if anyone wanted to come, and Kirk and Robert both said they wanted to. I had given a list of what I thought as possibilities, and Kirk wanted to do the “epic” option. Robert wasn’t sure he could do it, but decided to try it. 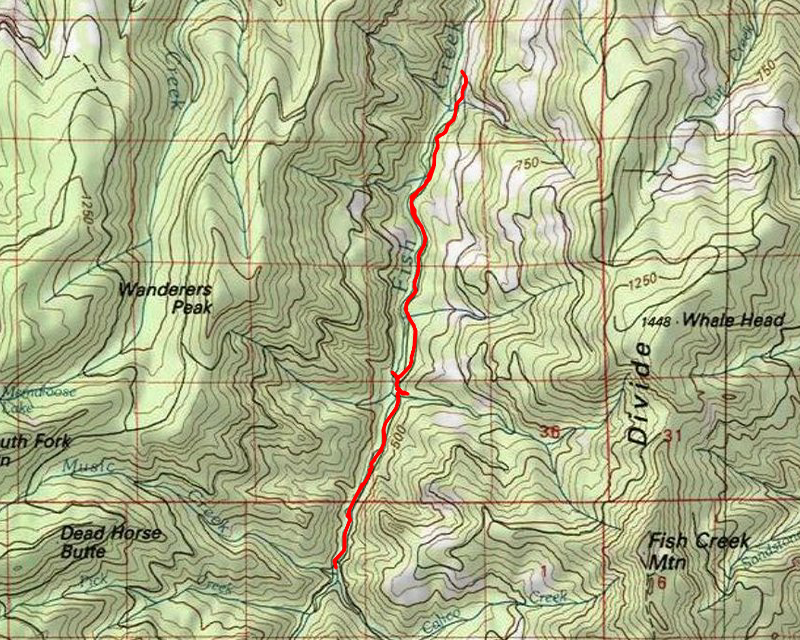 The plan was to hike the old road 54 down Fish Creek to the confluence of Fish and Wash Creeks and then head down Wash Creek to Pick Creek. I figured that would put the day at 12-13 miles. We took some photos and then headed down the old quad track back down to the old 54 road. The beginning of the trail is in decent shape – not too many trees down, but there are sections that are getting VERY brushy. We didn’t do any brushing on the way in really, because we were trying to make time. The new cedar and fir trees that are now growing on the old road are really starting to encroach on the trail track. I’m hopeful that as those grow up and shade the old roadbed that it will be easier to maintain, but I guess time will tell how it all plays out. We made it back to the trail and continued south, fighting our way thru the brush and eventually making it to the second bridge about noon. We ate lunch there and pondered on what to do. The water there was running even higher and faster than third creek. We decided that this would need to be our turnaround point since it would take quite some time to cross this raging creek safely. We then turned around and headed back. Since Kirk had the loppers and I had the saw, we did a little more lopping on the way back, cutting back the worst of the brush – although it needs a LOT more work to make it easily passable. At the Third creek crossing we put away the loppers and saw and checked the time. We figured we were cutting it pretty close so we decided to stop doing any more lopping on the way back. We ended up crossing Third creek in a different spot than we did coming in. Robert and I made it just getting our feet slightly wet, but Kirk ended up getting pretty wet. He slipped on a rock and was up to his knees in water. But we all made it safely across the creek. After that crossing, we tried to hasten our pace to get back to the van by dark. We made it just before sunset I think – good timing.